Clear plastic hanger with notches and hooks for dress hanging. Dimensions: 16 3/4" x 9". Made in U.S.A.
17" Plastic hanger made for uniforms. 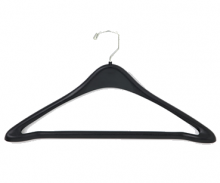 Black plastic with silver metal hanger. Made in U.S.A. Durable hardwood hanger with wooden pant clasp. Dimensions: 17 1/2" x 9 1/2". Made in U.S.A.